What will it take to bring progressive change? “I never looked at the primaries before, but this year they got my notice,” a former factory worker now stuck in a low-wage health care job exclaimed to me recently. She stays glued to the election news on TV whenever she can. Both women are typical of voters all over the country. They’re scared about the economic security of their families and worried about the future for their kids and grandkids. They want the war in Iraq to end. They’re registering to vote, changing parties where need be, and braving rain, sleet and snow to vote in the primaries. What will it take to change course in our country? The Take Back America annual conference convenes Mar. 17 to map out its national progressive agenda. The meeting comes at the completion of the fifth year of the Iraq war. Economists now agree that as long as the resources of the nation are squandered on the occupation of Iraq, it will not be possible to pursue an agenda of green job creation, health care for all, affordable housing or funding public education. The economy and the war are interlinked, and voters, including in swing states, are angry and aware. Republicans have chosen as their nominee one who envisions staying in Iraq for 100 years and who supports pre-emptive war regardless of the consequences. John McCain is in lockstep with U.S.-based global corporations who are out to dominate the world, destroy our constitutional rights, and drive down wages, benefits and economic security here at home. McCain represents a continuation of Bush or worse. Hillary Clinton’s statement that only she and McCain are tested to take an emergency call at 3 a.m. is wrong and dangerous. It raises false doubts about Barack Obama and runs the risk of discouraging voter turnout or sending swing voters back to the Republicans in the general election. A fear campaign cannot serve to change the course of the country. Hope, not fear, is the agent of progressive change. Racism, bigotry and anti-immigrant bashing also stand in the way of changing course. In Illinois’ 14th Congressional District, voters stunned the political world by electing Democrat Bill Foster to fill the seat vacated by former Republican Speaker of the House Dennis Hastert. Obama campaigned for Foster as “the change we need.” This victory shows solid red districts can be turned blue in November. In Maryland’s 4th Congressional District, progressive Donna Edwards’ decisive primary victory over Democratic incumbent Al Wynn proved a strong program to end the war and change priorities can win. “Our messages of change and returning Congress to focus on the interests of working families resonated loudly and clearly with voters all across our district,” she said. Like the Texas primaries, changing the course of our country is a two-step process. First, it will take a groundswell of voters to deliver a landslide victory in November for a Democratic president and to expand the Democratic majority in the House and Senate. But that is just the beginning. The energy, finance, pharmaceutical and military corporations will be hard at work to secure another Republican administration. Win or lose, they will exert their pressure on the next president and Congress. Corporate control can only be rolled back by organized grassroots pressure from union, African American, Latino, women, youth, senior, environmental and environmental voters. Labor’s campaign for the right to organize, and coalition organizing by peace and community groups for such needs as “not-for-profit” universal health care, affordable housing, equal quality public education, safe, clean energy and green job creation are at the heart of achieving a change of course in our country. At the top of the list to change direction is bringing all the troops home from Iraq and establishing a new foreign policy for real security based on peaceful negotiations and nuclear nonproliferation. It will take the organized participation of millions like the women I spoke with last week, and the young people standing up across this country, for a landslide victory in this historic election. 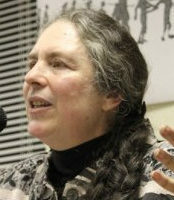 Joelle Fishman (joelle.fishman @pobox.com) chairs the Communist Party USA Political Action Commission and is also chair of the Connecticut Communist Party.